You can see the gradual sunset throughout the photos and we tried to quickly squeeze a bunch of photos in before complete darkness. I know I'm still sporting summer florals but it's summer year round in Los Angeles. Sometimes I wish it was colder so I can layer up in cute coats and scarves but for now it'll be cut outs dresses and sunnies. It's essential to stock up on sunglasses living on the west coast, especially go to ones you can pair anything with. I also love whimsical, one of a kinds like the Cross My Heart sunnies c/o Zero UV. 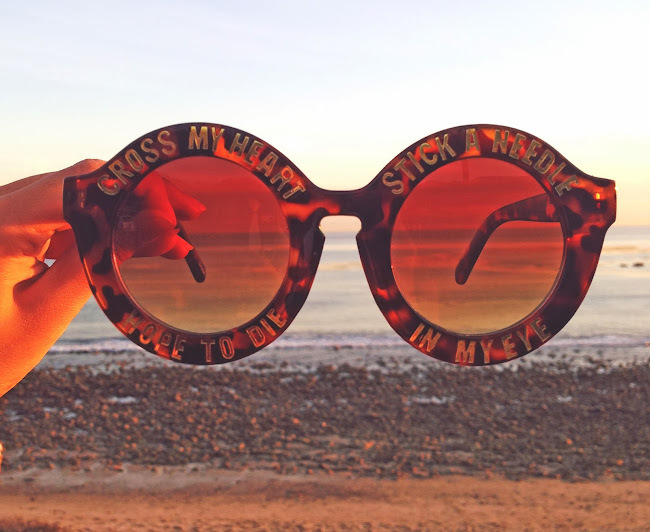 The retro round shape and cheeky words around the frames are so fun to wear. I'm wearing a Lucca Couture dress I found at Crossroads. I called it the magic eye dress because the tight knit patterns and colors look like those magic eye diagrams I was never able to figure out and probably never will. damn, i'm loving those shoes!! Love the whole look! Your photos are absolutely gorgeous - lucky girl living in LA. SO pretty and great dress. love the dress.. really cute..